The Bruins just played Tampa Bay on Thursday. Recap Here. The Bruins are running a toy drive with Toys for Tots on December 8, 13, 18, 20. If you donate a toy, you get a ticket voucher for an under-12 kid. The Bruins have gotten their PK all the way up to 83%, ranked 11th in the league. The PP is 4th, with 23.08. 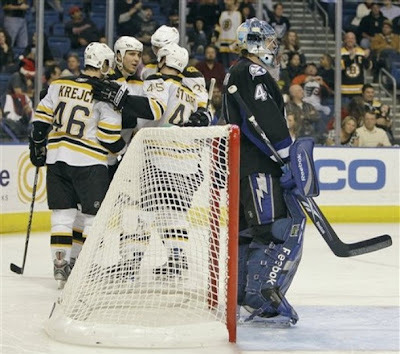 The Lightning were the last team to score against the Bruins, when Lecavalier fed Martin St. Louis a beautiful pass and St. Louis put it in. Steve "New Face of the Franchise after Vinny Retires" Stamkos has been getting better after his slow start. Phil Kessel is tied for 3rd in goals scored. Marc Savard is tied for 3rd in assists. Savard has 0.92 assists/game. Blake Wheeler and Marc Savard are in the league's top 5 for Plus/Minus, even though it's a relatively bogus stat. The New York Rangers have 8 Shorthanded goals against, leading the league. This makes me smile. The Bruins have twice as many points as Tampa Bay, 26 games in for both. Boychuk got sent down a while ago. Eric McErlain has a nice piece on the Bruins post-Thornton. Sturm and Ward skated this morning, but not fully. They're out tonight, but expected to be in Washington on wednesday. The Bruins have been doing really well without these two recently, but having Ward to help bottle up Ovechkin would be pretty huge. Cam Neely likes how the team is doing. Congrats to Naoko Funayama on getting married, and SA Goon Unmasked Gremlin for having a baby. Here are some pre-game interviews. I don't have time to watch them, so there may be something good in there that I don't know about. Stanley Cup of Chowder: Dammit, I totally picked that picture out at like 8:30am this morning, but I publish at 4pm. I'm keeping it. Deal with it. Kynch's Korner: "One thing you can say about this B's squad: they have a great killer instinct." Double A Hockey: "I'm not sure who will be in goal, but either way I'm not worried." The Bear Cave: "Their 20 points are fewest in the NHL"
The 2 Man Advantage: "Boston is just too strong right now hopefully they don't take their foot off the gas." I hear you, Nemmy.